The U.S.S. Enterprise is without doubt the most famous starship in history. The vessels that have carried the name have saved the galaxy countless times and her captains, including Archer, Kirk, and Picard, have been legendary. This Haynes Manual provides in-depth information about these extraordinary ships, from the Enterprise NX-01, to Captain Kirk’s Enterprise NCC-1701 and Captain Picard’s Enterprise NCC-1701-D including histories of each vessel, technical information about their systems, and discussions of key technologies such as transporters and warp-speed travel. Find out exactly what powered these ships, how they were armed and what it took to operate them. The book features newly created artwork throughout, including full-ship cutaways of each Enterprise, key systems, and interior locations together with detailed new exterior views by one of STAR TREK’s original visual effects artists. 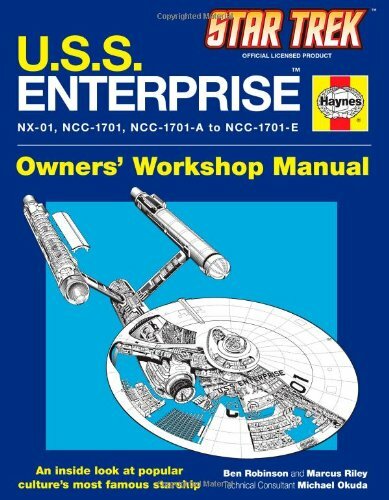 This Haynes Manual is fully authorized by CBS and technical consultant Michael Okuda, who spent thirteen years working on STAR TREK TV series and movies.